Assimilation of observations into ocean circulation models has become a worth-while endeavor now that synoptic data from satellites are becoming available. 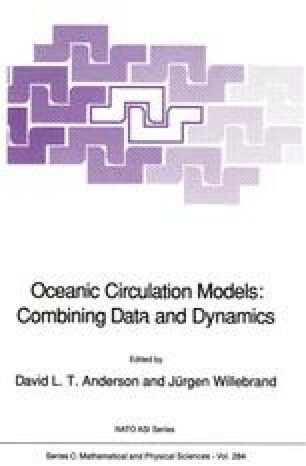 In contrast to the atmospheric case, however, where fairly complete observations of the three dimensional structure of the atmosphere are available through an extensive observing system, the oceanic assimilation problem is much more difficult and will require quite novel techniques for blending observations and model predictions into a best possible, coherent picture of the four dimensional oceanic circulation. This is because ocean observations will be available mainly at the sea surface from the ocean satellite observing platforms. Ocean models will have to play a much more important role in that they must be able to successfully extrapolate surface observational information downward into the ocean interior if they are to achieve success in reconstructing a realistic ocean circulation.